REVIEW for Criminal Minds Episode 14x13, "Chameleon"! REVIEW for Criminal Minds Episode 14×13, “Chameleon”! 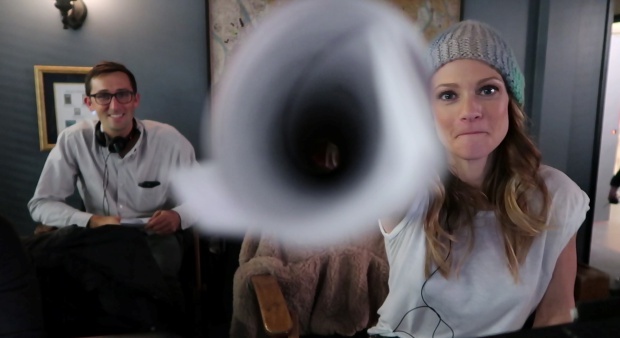 In one of the most eagerly anticipated episodes of the season, we finally have the opportunity to see how AJ Cook calls the shots in her directing debut. The answer is no, as the story unfolds bit by bit in a hesitant and solemn retelling by Rossi. Like the tragedy of Sick Day, one of our agents has experienced a truly terrifying day on the job, and it’s not only still affecting him adversely, but our entire team, too. Because they love him. Through flashbacks, we’re slowly privy to how the investigation plays out. But in the now, Rossi makes his way to the BAU, unsure if he should even be there. Penelope and Luke are gentle and solicitous, and then he notices Reid still going over evidence (the quick scene between the two men is measured, and telling. Spencer is consumed with ferreting out why a key clue escaped his notice, but his distraction isn’t enough to keep him from asking, almost immediately, how Rossi is doing). Penelope doubts Reid had even been home that weekend. Emily asks Rossi to go home, and to trust those who love him to help him through this. Rossi feels annoyed, and guilty. It’s his job to take care of them, not the other way around. He goes home, ending up in a surprised yet compassionate Krystall’s arms as he finally lets the fact that he was almost killed sink in. Quite a lot about this episode is different than what we’re used to. The music is funereal and foreboding, a lot of cello, but doesn’t overshadow the dialogue. The quote is given via Krystall’s reading a text from Portia, on camera, instead of an overdub, and the focus is softer in the flashbacks with the UnSub. Also, the questioning of the victims surviving family members yields a common thread, the UnSub had had a daughter named Grace. I want to talk a little about the direction. It’s too early to pinpoint AJ’s directorial style, but she does seem to favor close-ups and two-shots, and her deliberate use of lighting, music or the lack thereof, and angle, is indistinguishable from a seasoned pro. She likes to shoot things through things, like window blinds, the other side of a shelf in a filing closet, and Reid coming to a realization in a full-length mirror was duly appreciated. One notable shot that I really loved was Rossi and Tara, guns drawn and chasing the UnSub, are framed through both an open barn door, and the far side of a pickup truck window. The spinning reveal shot of all the victim’s removed faces was shocking and gruesome, as it should be. Awesome. The mini NYPD Blue reunion we are treated to was unexpected and a lot of fun, as we got to see Sharon Lawrence as the UnSub’s incarcerated con-woman mother vamp and chew her way through an interrogation by Luke and Matt. She puts them both off their game with her flirtatious antics, and it’s amazing. Gail O’Grady’s Krystall endears me to her more every time I see her. There’s a lot she doesn’t really get about their methods, but she keeps up, and her reactions to Rossi’s tale are real, and normal. She is us. She listens to her man, but lets him know she’s an active participant in his story by asking questions when she needs to. Their beautifully staged and framed discussion on the back patio is warm, loving, and safe, even though the subject matter is anything but (Nicely done, AJ). Both women were excellent in this episode, and kudos to casting for choosing to showcase both these talented actors. Seeing Rossi in this vulnerable a place is definitely NOT something we’ve seen before, and it’s disconcerting as hell. Even moreso for the character, as we are witness to his admission that he’s maybe not the right guy to be out there kicking down doors and literally chasing killers, any more. Krystall’s gentle reminder that his mind is still his sharpest weapon is necessary, and vital for him to hear, as she can see he’s a man feeling his mortality, maybe for the first time. The UnSub gets away (rare on our show), Grace is revealed to be alive and now participating in her father the UnSub’s murders (she wasn’t the victim’s daughter after all- excellent twist! ), and the end scene shows Rossi confronting her in her jail cell with the final words “Let’s talk about your dad.” Perfect. – What the hell was the green jello all about? – Why didn’t Emily send Spencer to speedreid through the paper files instead of Matt and Luke? – Garcia’s mini dustbuster gives me life and I must have one. – The vase upside the head was shocking, yet oddly hilarious because of how annoying that sweet woman was. Both my son and I chuckled at that part, as horrible as it would be to witness in real life. – Can they just give Paget Brewster an Emmy now? How bout now? Now? I believe and care about every single word she says. She’s truly a great actor. – Like many have said, just how dumb were these women that they couldn’t tell fake facial hair from the real thing? I would have liked to see that last victim free herself somehow, and come running out of the barn to warn Rossi and Tara. In any case, beautifully done by all, especially AJ, Breen, and Charlie, and it’s obvious that Chameleon will stay on our minds and in our hearts as one fine example of Criminal Minds excellence. Next episode is Reidless, BOOO, but it looks to continue Rossi’s difficulties, which means more stellar acting from the master, Joe Mantegna. I’m totally there for that, and then cannot wait to see what’s in store for the season 14 finale. Only two more episodes to go in this season, guys! Already? ← *EXCLUSIVE* Interview With CM Script Coordinator Charles Dewey! Tari, “Chameleon” was a fabulous Episode, & your written review, is simply fantastic. Thank u so much, for sharing your Talents with all of us, who are gladly within the “Masterful Circle” of #TheBAU. I would like to take a moment, to just say thank you, from the bottom of my heart, to everyone, past & present, for all of their hard work toward making @CrimMinds_CBS what it ALWAYS has been… The, best Show, on TV, a true Masterpiece. ((Hugs,)) I love you all, like you’re a part of my Family, you’re truly the best!!! Thank you for your enthusiastic support, Chad. So glad you liked the review! Can’t wait to hear what Grace has to say about her dad! And, of course, more Roberta would be awesome! Well done. Sharon!